Internet is a highly competitive territory with tens of applications and platforms available. In today’s world, content management systems are ruling the roost due to their flexibility and user-friendliness. Drupal is an open source content management system which is written on PHP/MySql. PSD to Drupal is thus one of the most accepted ways of web development. You have an option to customize the pre-existing web themes or templates in order to develop an attractive and suitable web portal, but opting for a custom development would be the best. You can get a unique and highly functional website using PSD to Drupal conversion technique. Being compatible with Windows, Mac and Linux has also added to the popularity of Drupal. PSD to Drupal theme conversion has become the most standard way to increases the overall performance level of the particular website. The themes are search engine optimized with clean codes which add the more viewership of your website. They are tested for cross-browser compatibility in web browsers such as Internet Explorer, Firefox, Chrome, Safari and Opera. The coding needs to comply with W3C standards to ensure that the website stays in sync with the latest technological changes and scalable among web spiders. To start with PSD to HTML/the Drupal conversion, take a well-designed Photoshop file and start slicing it into different layers. Be careful with this step as your slicing might determine the looks and functionality of your website. Save all these slices as individual files in RGB mode as this will enhance the color quality. Hand code PSD to XHTML/ HTML/ CSS markup languages. Hand coding of the index page is must as this will ensure the better ranking on the search engine. There are lot of online tools which help you to perform the coding immediately, but they can be best described as ‘sloppy’. Work carefully on the CSS file as this will determine the consistency of the website and also reduce the time taken to load your website. In the next step the XHTML file is converted into a Drupal template. You will need to download the latest version of Drupal theme from the internet and install it in your local system. Create a new folder and take the sliced elements in this folder. Open the file called page.tpl.php and make the changes to a new file called page.tpl.php, and copy changes to style.css within new theme directory and you are done. In the next step you will also carry out the final customization of the website in this step. All the different elements are put together to form a comprehensive website. You can make use of the web interface to insert a few third-party plugins into your website. But makes sure these plugins complement your website. Once you have converted PSD to Drupal Theme you need to work on the content customization next. The web interface allows you to customize different types of text, blog, video, and polls etc. You will also be able to make some customary changes in your website by adding plugins to your website using the admin panel. 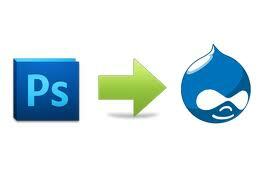 There are many features that you can integrate into a Drupal theme when you Convert PSD to Drupal. This includes modular framework, user account registration, menu management, RSS-feeds etc. All these need an expertise and it is advised to hire a dedicated and professional service provider or company which can assure you all these features, also ensure you guarantee of high quality work at the same time cut your development costs substantially.